Croatia is known for being one of the most visually stunning countries in the world. From Zagreb to Dubrovnik, this tour will take you on a visual and sensory exploration of Croatia, one of Europe’s great hidden gems! Discover rich history and culture, great food and wine, and a spectacular coastline with over a thousand islands. Visit well preserved castles, and explore several UNESCO World Heritage sites, including the stunning city of Dubrovnik on the Mediterranean and Plitvice Lakes linked by spectacular cascading waterfalls. This tour has it all! Price per person land only $3,999.00 based on two sharing and minimum of 10 passengers. (Limited to a maximum of 12) Not included: personal expenses, international airfare and taxes, meals not specified, tipping. Single supplement $950.00 *Private transfers are available at an additional cost for those not arriving at the same time as the group. Hold your space with a $600 non-refundable deposit. Welcome to Croatia. Upon arrival, we are met by our driver and transferred to our hotel. The rest of the day is at leisure. Our morning tour takes us to St. Mark’s Square, City Hall, Parliament, the Stone Gate, and on to the famous St. Stephen’s Cathedral. 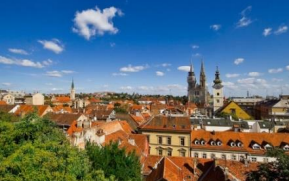 Zagreb is often referred to as the “small sister of Vienna”. In the afternoon, on the drive to Trakoscan Castle, we pass by romantic castles perched on hills scattered with vineyards. After our tour of the castle there is an opportunity to see a stunning lake before returning to Zagreb. After breakfast our scenic drive takes us to the Plitvice Lakes area, a UNESCO World Natural Heritage site. Included is a guided walking tour to see some of the 16 lakes and 92 gorgeous cascading waterfalls. The forests in the park are home to bears, wolves and many rare bird species. 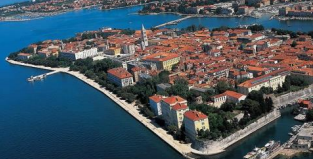 After lunch, enjoy a scenic drive along the Adriatic coast to Zadar. 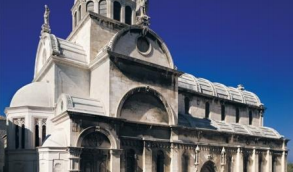 Today’s touring includes a visit to the famous Kalelarga Street and the church of Saint Donat. Zadar is famous for its fish market, and is a wellknown vacation spot for sailing and climbing. Zadar is also famous for its Roman ruins. Enjoy free time to explore the city on our own. After breakfast, we drive to Sibenik situated along the mouth of Krka, famous for its picturesque waterfalls. Sibenik is culturally rich and is the oldest Croatian town, first mentioned in 1066 during the reign of Croatian King Kresimir IV. We also visit St. Jacob Cathedral, a UNESCO World Heritage site. Later in the afternoon we continue our scenic drive to Split. Our morning tour begins with a visit to the Palace of the Emperor Diocletian, built in 295 BC. Outside the palace are many charming piazzas. Our tour ends at Riva where, after a coastal walk under palm trees, we can relax in the sun and enjoy a beautiful view of the port and islands. Our afternoon is free to explore Split. You may enjoy an optional visit to the Mestrovic Gallery featuring works of the famous Croatian sculptor Ivan Mestrovic. This morning we ferry to Stari Grad, the oldest town in Croatia on the island of Hvar. From there we continue to the town of Hvar. You may wish to stroll along the scenic harbour enjoying a delicious gelato in the late afternoon sun. After our last tour to Croatia the ladies said a couple free days in Havar was a must so we have included it on this tour! You may wish to join the locals for their daily coffee drinking ritual in the town square. From Hvar harbour take a water taxi to one of the beautiful beaches: Jerolin, Stripanska or Palmizana Beach. If you prefer to stay in town, visit the Hvar Fortress Spanjola on the hill above the town, or the Theatre and Arsenal in town. Shopping is a unique experience through the very narrow streets dating back to 350 BC. This morning we ferry to Drvenik Port and drive to Ston, a medieval village surrounded by a great wall and a famous oyster producing area. Appreciate a glass of wine with our included oyster tasting in a local restaurant. Enjoy free time for lunch and a stroll through the village before we continue on to Dubrovnik. 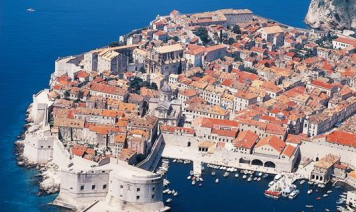 called Dubrovnik the “Pearl of the Adriatic”. The city is famous for its marble streets, baroque buildings, and Renaissance fountains. After lunch our local guide will lead us on a walking tour of the city walls offering breathtaking views of the sea, Lokrum Island, and the red roof houses in the town. This morning we depart from Gruz port to explore the Elaphiti Islands by boat. The three largest islands, Kolocep, Sipan and Lopud, are famous for their organic fruit and vegetables, olive groves and wineries. Inhabitants of this area are known for their passion for good food and drink. From our boat, we pass ruins of old patrician holiday villas. This afternoon free time allows for leisure and swimming on the sandy beaches. We return to our hotel in Dubrovnik in time for our farewell dinner. After breakfast, our group transfer to the airport is included return flight home (not included).